It’s February break in Connecticut and a friend’s wedding in LA, a very hospitable Mid-Pacific Institute, a cheap flight, and my own curiosity brings me to Hawaii. While this trip is self-funded, there’s lots to be learned that can benefit GHS Innovation Lab. Education is a field so crowded with acronyms that a colleague once had a running list with abbreviations in the triple digits. PBL and STEM are the two we’ve grabbed on to and while we’re confident we have a good handle on what makes good project-based learning, the E in STEM often eludes even the best project planners. It was the missing link when Mike and I were at High Tech High last month and he asked of our current STEM plans, “when are you actually building anything?” Between yesterday’s impressive display of hydroponics and my experience with the 10th grade electric bike project today, engineering is elevated at MPX as a justifiably equal part of the STEM equation. 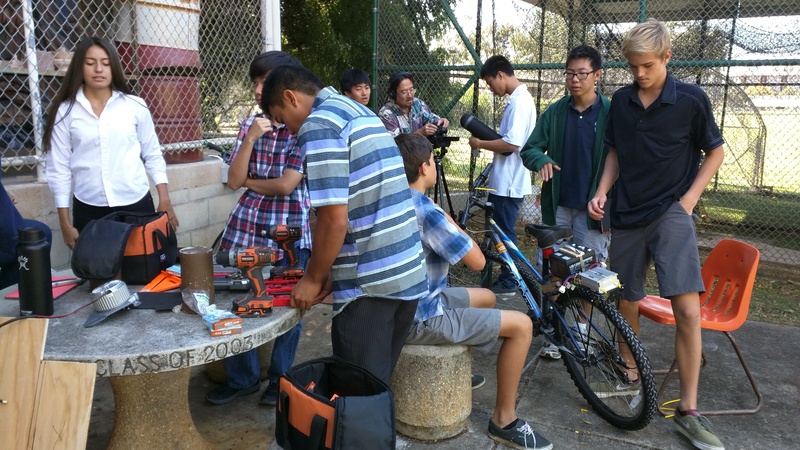 Mark Hines invited me to observe his 10th grade MPX STEM students, who are towards the end of a project with a goal to create an electric bicycle that does not replace human power, but assists it, especially in uphill situations that may involve a payload (groceries, for example). The supporting coursework involves Algebra 2 and Physics. The motivation behind the project, which was the brainchild of Mark and 10th grade humanities partner Laura, revolves around sustainable transportation in Oahu. They communicated with companies, cycling organizations, and manufacturers over the summer to find a motor that would be appropriate for their classes and came up with a bare-bones DIY kit that students started with in the fall. It included a motor and rechargeable batteries. 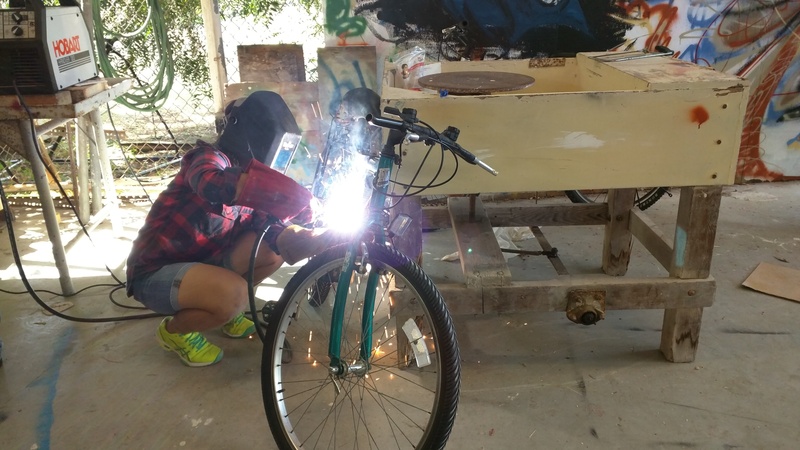 In September, students visited a bicycle repair shop for three consecutive Tuesdays to disassemble and reassemble bicycles so they knew how to work with bikes. In October, they hooked up their motor and throttled it, doing a ton of work with circuitry, wiring, and electricity so they understood how the motor worked. They’ve been adjusting the donated bikes, which are all different, to fit the motor based on designs they worked on in class. MPX uses more cardboard and foamboard than I’ve ever seen before to create scale and replica models. Now, they are grinding and welding the bikes and the steel supports to attach the motors. Today, a member of the Hawaii Bicycle League helped troubleshoot design and a local multi-talented craftsman assisted with metalwork. Recently, three students took a three-hour welding class on a weekend because they were interested in becoming the experts for the class. This is the type of engineering work that other self-described STEM programs often cannot do, whether it be a financial constraint or a space issue. The space available to Mark’s students straddles a clay work area and batting cages down by the baseball field (see the top photo in this post). MPX is in their sixth year and Mark is quick to note that in their first years, the scale of the engineering they could do was much smaller. He was bringing in his own tools and doing projects that didn’t require as much building. 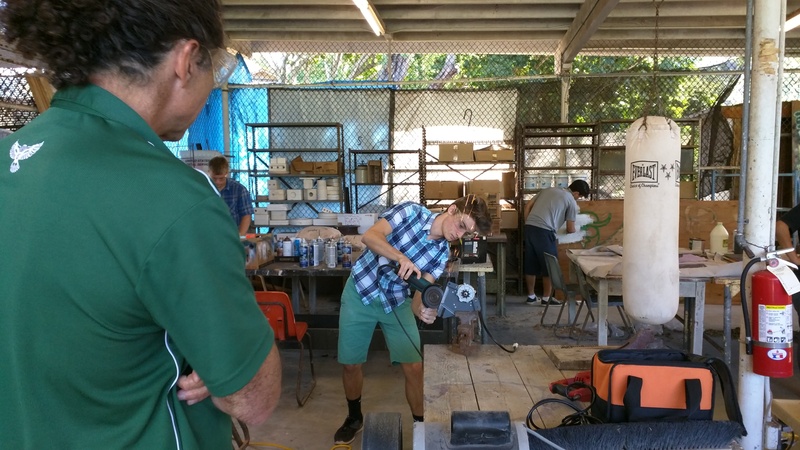 Parents and community members have been instrumental in donating their used tools to MPX and have thus allowed students to create and build in the capacity they can today. When MPX was started, Mark wondered about the community’s capacity to be involved as much as they are. Now? “I don’t have a fear of us maxing out the community partners that are willing to do this work. The hardest part is scheduling.” Rotating school schedules can be convenient for us, but it’s tough to ask a welder to come at differing times during a week. This all sounds great, but where’s the math and physics? Is this replicable? The answer is a resounding yes. While today was a build day (and there are one or two per week), other days are spent learning math topics like complex numbers in a more traditional way, measured by a typical quiz. Feedback from students and teachers who are graduates of MPX were that they needed a bit more exposure with traditional topics to be successful in a non-PBL class. Today, Mark assigned a blog post where students needed to research a physics topic related to their work with the bikes and be ready to talk about it in class next week. When students were building and testing the motor, they did a ton of classwork about electricity. The science and math are well represented. I rotated around to groups and asked students about their work on the bikes (I was intrigued!) and their thoughts about MPX. When I told them Innovation Lab would run with grades 10-12, they were a bit jealous. MPX is 9-10 only and some are not looking forward to transitioning from project-based learning to a more traditional model. A student who joined MPX as a 10th grader said “this program is more self-rewarding” than the alternative. The prospect of having a fully functional electric bike is motivating and rewarding. Another student (who admittedly has been told she’s blunt) said traditional school is comparable to giving a dog a treat – “you get rewarded with an A or punished and put in the corner with your F.” It is obvious that students here value the process because it’s been reflected in their grade and, as two students told me, because what they’re doing is more interesting. A student pulled out an iPad and offered to show me a math project they were finished up that related cubism a type of art, to math. Students created original pieces after consulting with an art teacher, visited an art museum to see examples, and are in the process of recreating the art in Desmos. The positives? “We got to choose the style we wanted to mimic,” a student named Justin told me. “I’ll remember this longer because it’s my drawing and it’s my own work.” He estimated he’s put 80 hours into this so far. I asked how that’s even possible and he mentioned being given a lot of class time, but also the drive to finish this original piece. The math behind it? Systems of equations, lines, quadratics, conics, trigonometry, etc. This is totally differentiable based on student level, as can be seen by the mostly linear example. Other comments from students? “I’m not a learner where I can sit and listen to a lecture,” one student said. Another mentioned they have trouble paying attention. One felt overwhelmed in the traditional program (sounds familiar to many of my own students), but project-based learning was more interactive. I asked specifically about humanities and students described mock trials or writing their own play about the Revolutionary War instead of their prior experience of “writing a ton of essays.” Students read thirty books per year in categories such as nonfiction or historical fiction. Only one is in common (Huck Finn). This is contrary to our own plans, but there’s something to be said for student choice in reading. When I described our plans to a student, she said somewhere in the middle might be good – more books in common, but plenty of choice is key, too. “I like the challenge when there’s not a set topic and we get to choose,” she said. Choice and individualization naturally push students to do more impressive work because the ownership is there. Whether it’s their particular design for their team’s bike or the artwork in the math project, creative input is valued and expected. This entry was posted in Outside GHS, What is PBL?, Why Change?. Bookmark the permalink. Aloha Brian – Thanks for your incredible willingness to be flexible, for taking the time to talk and understand our kids and our program and for capturing it in these wonderful reflective writings. We appreciate our deepening collaboration with you and your team and are excited to continue to forge our common vision into some plans of joint action like protocols and continued sharing!